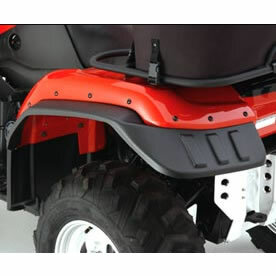 Kodiak overfenders or fender flares come in a set of 4 for both front and rear wheels for your ATV. Keeping the mud off you so you're clean when you get home. Easy install, includes mounting hardware and instructions. Shipping available within the continental U.S.A and Canada only. To search for Kodiak parts parts such as brakes, clutch, exhaust, suspension parts view Kodiak 400 or 450 in our Yamaha microfiche pages.